It’s rarely a surprise to see an AKG microphone on one of our microphone charts – they manage to offer some impressive models in all price ranges. Their dual diaphragm P420 is a great condenser mic that costs less than $200, although it seems suspiciously similar to the lower priced P220… So, is it worth the price increase? Let’s find out! In the grand scheme of things, the P420 looks like your ordinary condenser microphone – nothing special, but ultimately quite attractive. The champagne-finished grille makes up half the length of the mic and is divided into three segments. Note that the P420 features a side-address design, combined with a top address that is common in this segment of the market. AKG have used quality materials for the all-metal chassis, with a confidence-inspiring weight and a stealthy matte black finish. It feels like a mic that should cost more than its sub-$200 price tag. One of the P420’s major appeals is its dual diaphragm design, with a large 1” diaphragm. Aside from improved detail and clarity, this also means that you get more than one polar pattern, with the choice of three in total: standard cardioid, omnidirectional or figure-eight patterns. This is where the lower-priced P220 falls short, only offering the fixed cardioid pattern. The P420’s frequency response range spans from 20Hz to 20kHz. It also comes with switches for a -20dB pad and a bass-cut filter, with the latter allowing you to trim -12dB at 300Hz, adding to the versatility of this mic. The attenuation pad allows you to use the microphone for applications where a high SPL is to be expected (instruments, we’re looking at you!). In fact, you can push this mic up to a considerable 155dB SPL simply by flicking that switch. In addition to the mic itself, you will find an attractive aluminum carry case along with a very decent shock mount. 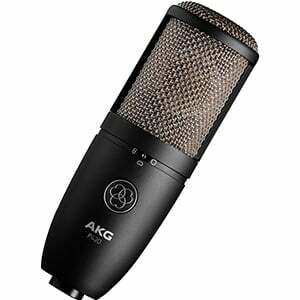 Pull out your encyclopedia and look up the definition of ‘general purpose condenser mic’ and a picture of the AKG P420 will be there! That’s because this microphone can be used for just about any application. It takes vocals very well, with plenty of warmth and clarity, while recording instruments is a breeze. Thanks to that attenuation pad, you can even use it to record tricky instruments such as brass. The trio of polar pattern choices offer more flexibility when recording room sounds or wide sound sources, such as orchestras or choirs. Ultimately, this is a mic that doesn’t mind being pushed hard. On top of that, it’s extremely flat with almost no coloration added to what you’re recording. Considering the relatively affordable price tag, this gives you great value. If you haven’t already guessed it from this review, the AKG P420 is a winner! While it won’t win you over on looks alone, it is a true workhorse in terms of performance. If you need the enhanced versatility of the switchable polar patterns then this is a solid choice – if not, check out the P220 for a cheaper version of the same thing. For more info about the AKG P420, click here.